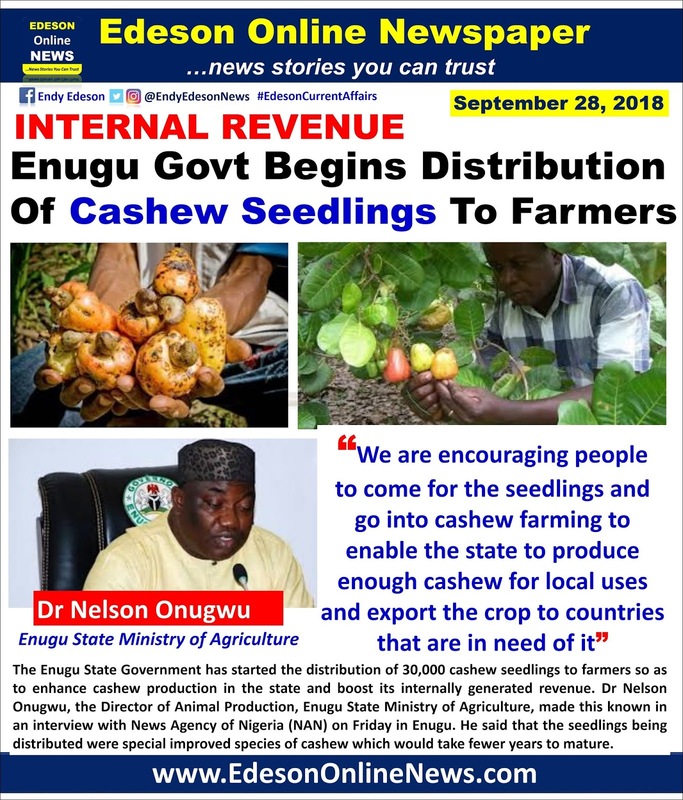 The Enugu State Government has started the distribution of 30,000 cashew seedlings to farmers so as to enhance cashew production in the state and boost its internally generated revenue. Dr Nelson Onugwu, the Director of Animal Production, Enugu State Ministry of Agriculture, made this known in an interview with News Agency of Nigeria (NAN) on Friday in Enugu. He said that the seedlings being distributed were special improved species of cashew which would take fewer years to mature. 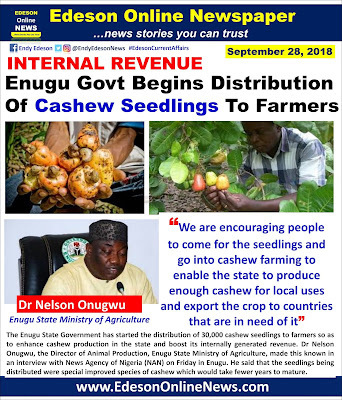 Onugwu said that the distribution of the seedlings was aimed at encouraging people to go into cashew farming to boost local cashew consumption and exports. “We are encouraging people to come for the seedlings and go into cashew farming to enable the state to produce enough cashew for local uses and export the crop to countries that are in need of it,” he said. Onugwu said that the state government had subsidised the price of the cashew seedlings, adding that consequently, the price a seedling was now N50, instead of its normal price of N200. The director said that the state ministry of agriculture had also informed council chairmen in the state to come over to the ministry and procure the cashew seedlings for distribution to farmers in the council areas. Besides, Onugwu said that state government had established cashew aggregation and processing centres across the state to facilitate cashew processing and packaging. good one from the govt . no more reliance on oil. Emeka, I don't think Enugu is an oil producing State. I believe they mean it this time Bussy. Do you mind joining Cashew farming?